Diphetogo "Dipsy" Selolwane is an Botswanan international footballer. Diphetogo "Dipsy" midfielder for South African Premier Soccer League club Supersport United. He has played as a striker in Major League Soccer. Selolwane first played for Gaborone United in the Botswana Premier League. After playing college soccer at St. Louis University and being named first-team All-American in 2001, Selolwane was drafted 36th overall in the 2002 MLS Superdraft by the Chicago Fire. Selolwane was traded to Real Salt Lake after the 2004 MLS season but failed to make an impact and was released during the 2005 season. In four years of limited action in MLS, he scored three goals. He returned to Africa, first to Botswana and then to the South African Premier Soccer League. His first PSL club was Santos, before moving to Jomo Cosmos, after having a very disappointing 2006-07 season. He signed with Ezenkosi for the 2007-08 season, but made only two appearances and joined Ajax Cape Town in early 2008. His PSL career flourished at Ajax, where he was converted to a midfielder and earned a July 2010 move to league champions Supersport United. 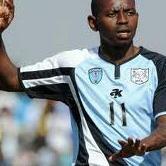 Selolwane is also a significant player for the Botswana national football team.